MOODY’S ratings agency has reaffirmed Papua New Guinea’s B1 sovereign rating, but warns that despite the potentially “transformative” flow of gas that began last month, growing government debt threatens a downgrade. In a detailed new overview, it says it has “a poor assessment of governance” in PNG, and stresses the lack of diversification in the economy. And it says the government’s takeover of the Ok Tedi mine last year “has raised concerns regarding the risk of expropriation” — echoed this week by the circulation of a claim by Bougainville President John Momis that PNG Prime Minister Peter O’Neill talked with him in February about taking over Rio Tinto’s 54.6 per cent control of Bougainville Copper. 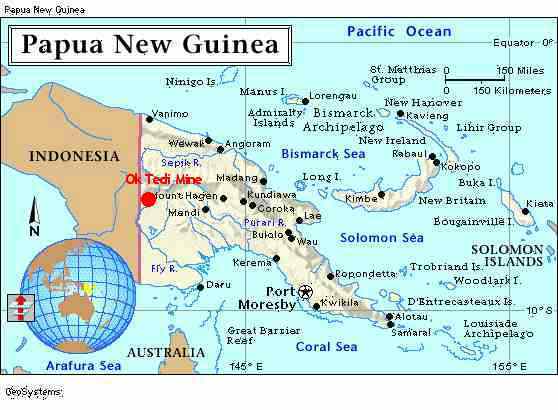 Mr O’Neill strongly denied this claim, however, and said the future of the Bougainville mine was in the hands of the local ­people. Moody’s says the Ok Tedi takeover is related to “myriad complex issues” over 20 years, and thus “may not necessarily reflect the broader state of play” — adding that the completion of the LNG project benefited from “pragmatic government policy and engagement with the private sector”. But it ranks PNG’s institutional strength as very low, next to last on a scale of 15. It says that “transparency surrounding off-budget and public-sector enterprise borrowing is lacking”, so that its debt levels are not clear. The agency says liquefied natural gas exports will increase PNG’s economic growth — now in its eighth year of growth above 6 per cent, except for a slide in 2013 to 5.1 per cent — and the government’s fiscal position, as well as the balance of payments. It forecasts gas-fuelled growth to soar to what will probably be a world-beating 21 per cent next year, and says that the successful implementation of the PNG LNG project paves the way for further energy and mineral projects. However, at the same time it notes “a marked deterioration in (PNG’s) fiscal and debt metrics over the past two years”. Funding pressures have been muted due to the government’s reliance on low-cost domestic sources of financing, with liquidity ample. Government spending rose sharply from 30.7 per cent in 2010 to 37.1 per cent in 2013. Moody’s says that “fiscal rules have been continually amended to accommodate the consequently large increases in debt, eroding the country’s earlier track record of fiscal prudence”. It says that the government’s $1.2 billion loan from UBS for its 10.1 per cent stake in Oil Search, PNG’s biggest company, increases its direct burden to more than 45 per cent of GDP, from 34.3 per cent last year, breaching the 35 per cent debt cap. The agency says that if the government can manage effectively the gas windfall and the consequent high growth, to ­ensure relatively low inflation and sustainable external payments, that would be “credit positive”. However, if the government is unable to restore fiscal discipline, or funding conditions turn ­adverse, making it hard for the government to service its debt, this would result in “downward pressure on the sovereign rating”. Political instability has returned this year, with “substantial ministerial turnover”. But this “does not yet pose a significant threat to the country’s near-term growth outlook”. Income levels in PNG, Moody’s says, are expected to reach just $3200 per person a year in 2016 — “indicating relatively poor human capital”.